PolitiFact rated a claim made by Sen. Kamala Harris (D., Calif.) during a hearing for Supreme Court nominee Brett Kavanaugh as "false." Harris claimed Kavanaugh characterized birth control as abortion-inducing drugs during his hearing before the Senate Judiciary Committee last week. On Friday, Harris tweeted an 11-second clip of Kavanaugh in which he says, "Filling out the form would make them complicit in the provision of the abortion-inducing drugs that they were, as a religious matter, objected to." The California senator jumped on the remarks, claiming "this is a dog whistle for going after birth control." "He was nominated for the purpose of taking away a woman’s constitutionally protected right to make her own health care decisions. 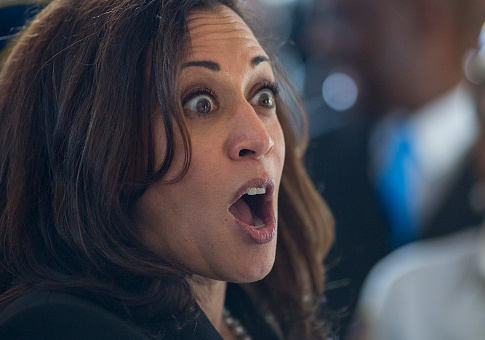 Make no mistake—this is about punishing women," Harris continued. Harris cut an important second out of the clip — the attribution. Kavanaugh said, "They said filling out the form would make them complicit in the provision of the abortion-inducing drugs that they were, as a religious matter, objecting to." "They" refers to a Catholic nonprofit group, Priests for Life. Kavanaugh was answering a question from Sen. Ted Cruz, R-Texas, about a case in which he argued Priests for Life shouldn’t have to provide women with the contraceptive coverage mandated by the Affordable Care Act for religious reasons. "It’s very clear he’s characterizing their position, which was held by all the Catholic organizations within that set of cases," Kupec said. In Kavanaugh’s dissent in the case, his characterization of the plaintiffs’ view does not describe all forms of birth control as abortion-inducing. "They complain that submitting the required form contravenes their religious beliefs because doing so, in their view, makes them complicit in providing coverage for contraceptives, including some that they believe operate as abortifacients," Kavanaugh wrote. Nevertheless, Harris’s communication director expressed dissatisfaction with the nominee’s complete remarks. "In his full answer, he uses the term uncritically," said Lily Adams. "He doesn’t say ‘so-called,’ ‘I don’t agree with it,’ there’s no caveat that he gives that he does not agree with the term." PolitiFact determined that Harris’s tweet was misleading. "In Harris’ tweet, Kavanaugh appears to define contraception as abortion-inducing. But the video failed to include a crucial qualifier: "They said." In fact, he was citing the definition of the religious group Priests for Life. He has not expressed his personal view." This entry was posted in Politics and tagged Brett Kavanaugh, Fact Check, Kamala Harris, Politifact. Bookmark the permalink.